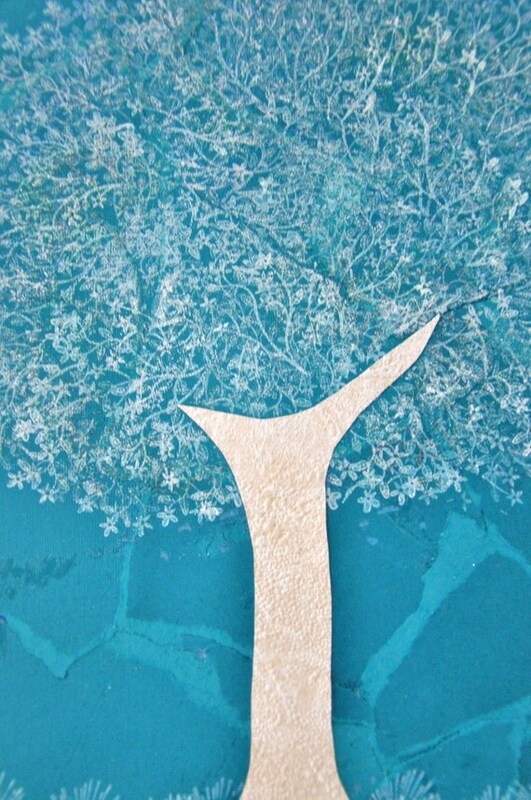 My heart doesn't want to let go of Christmas cards just yet...so I made one more today, the last day of 2010. As a holiday gift, we received a package of milk chocolates from England. Each small bar was wrapped with a different vintage Christmas image, such as the one above. I carefully removed the wrappers before doling them out to my family. Here, I matted it on a piece of black cardstock for stability and definition. The gold snowflakes and swirls are joined on one large acetate die-cut from K & Company's Brenda Walton collection. The gold ribbon is repurposed after receiving it on a gift this year. What a quick, easy card! Hello! 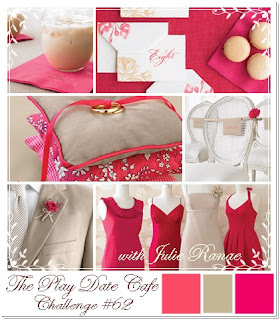 This week's color palette at The Play Date Cafe is soooooo feminine and beautiful. ﻿I took my inspiration from the shape of the man's jacket lapel, the caning on the chair backs (hence the gingham paper), and the romantic, floral images on the envelopes in the top picture. I finally broke out my Build-A-Brads from Stampin' Up! to make a custom-designed brad to match my paper. I've only had them for like, oh, 6 or so months (another hoarding problem...that's a story for another time). And I used the Botanical border punch by Martha Stewart to create a strip, then score it and tuck it under the gingham paper. A couple of low-rise dimensionals (SU) under the strip help keep it raised up. 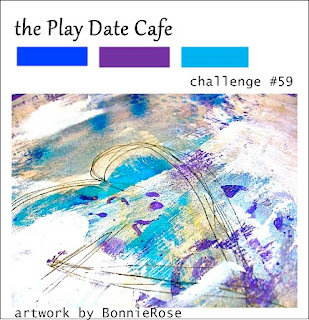 There is a paper-crafting goodie bag for this week's "Cup of the Week" winner at The Play Date Cafe. My sources tell me there's always great stuff in those goodie bags! Come join us! 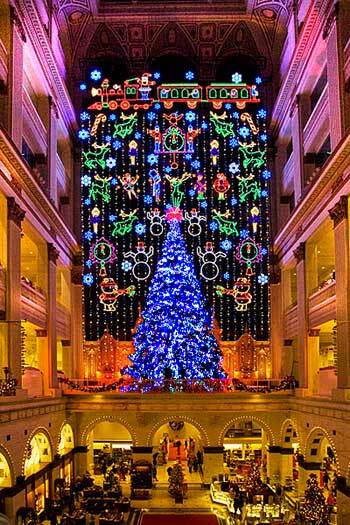 Today I am heading to the mall for some gift returns and lunch with my girls and my stepmother. Later we are going to the Franklin Institute in Philadelphia, my husband and the kids and I, to see the Cleopatra Exhibit. Thanks so much for joining me during this very busy holiday week. I appreciate your visit! Then we had lunch at the Reading Terminal Market, where you can get just about any type of food you want. My husband and I ate Middle Eastern food, but the kids opted for hamburgers. We brought dessert home: pineapple pie and rich chocolate cake from an Amish bakery there. Mmm! I did get a little bit of crafting time in so far this week, but much of it I cannot show you yet. 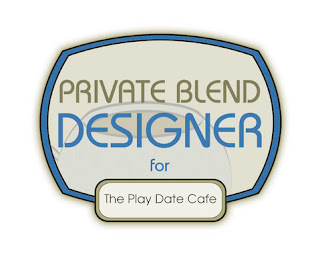 I am getting prepared for my new position as Private Blend Designer at The Play Date Cafe. That is still my best Christmas present!! 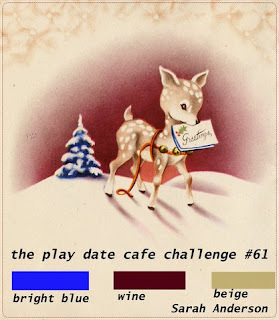 I'm anxious to share new creations each week based on the unique color stories presented by Julie Ranae and Sarah Anderson, owners of the Cafe. Please do come play! The card is 5 1/4" square, and I tried out my new Martha Stewart Scoring Board around the edges. What fun! I pulled out all the blue scraps of Stampin' Up! cardstock I own and there are sooooo many shades. I don't even know all the names any more, because many of them were In Colors long gone. I used a ruler to help me align all of the snowflakes. They were each popped up on dimensionals, and pearls were added. Isn't it pretty? Remember my Blog Candy Contest from a few weeks ago? My winner never showed up, and I allowed extra time because of the holiday. I am re-drawing a name right after I am finished with this post. Best of luck to you all! Thanks for joining me today. Happy New Year!! Paper: white by PTI, various blues by Stampin' Up! Ah, it feels good to be all "done" in preparation for Christmas! It helps that we are not hosting dinner here, but we are having my stepmother over for breakfast and that's a pretty casual affair. The Soft Suede card base was already cut out and folded for me (one of those wonderful things I find in my $1.00 Scrap Bags from my SU lady - thank you, Gail! ), so I adhered a piece of Sahara Sand off to the right on top, then went over the card base and Sand piece with Versamark ink and the Weathered background stamp (SU). The 'Comfort & Joy' stamp was a Recollections bargain from Mike's and it didn't have a name on the package, but there were four vintage-looking clear stamps in it. The paper I stamped on is a piece of what most people throw out: my Merrell shoes were wrapped in it inside a shoebox. It is rather thin and crinkly, but I loved how rustic it felt. The red strip is from Anna Griffin's Christmas die-cuts found on sale. Added some old SU buttons and rough twine and there you have it. Now I've got four cards (all this design) to put in my stash for next year. This qualifies for the Stampin' B challenge this week, too, which is to use ribbon or twine without using a bow or knot. 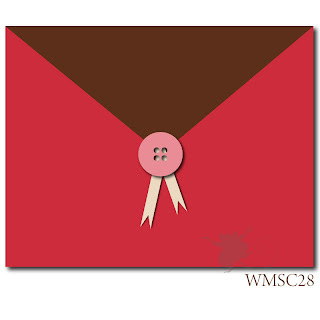 Well, my buttons are knotted, but not the piece wound around the card!! I'm off to work soon so I'd better go. Thanks for visiting with me this Christmas Eve; it's so nice to see you and I wish you the Merriest Christmas! Wow, it's the night before Christmas Eve! At certain moments, I can hardly believe it. I'm all caught up with the To-Do List and found time to play with my stamps this afternoon. Isn't that little vintage deer so cute? 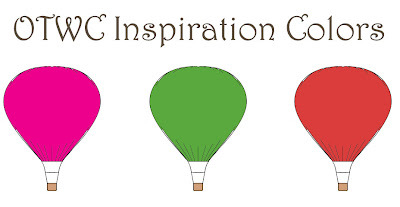 If you look closely at the inspiration pic, at the top there appears to be a quilted look. I tried to mimic that with my SU Texturz Plate "Perfect Details". Using a product called Treasure Gold by Plaid, I rubbed the gold wax lightly over the textured areas with my finger to highlight the subtle embossing. 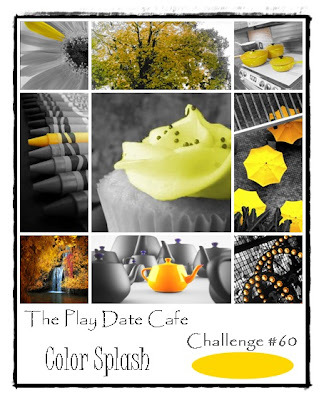 I'm still feeling "over the moon" about my appointment as Private Blend Designer at the Play Date Cafe. I hope to dazzle you all with my Play Date creations week after week beginning in January! 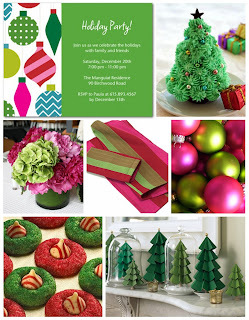 And please do come play, too; I'd love to see you there! Yesterday while we girls went to the orthodontist, Santa Claus stopped by our house and left a small gift for each of the kids. He took stuffed animals and American Girl dolls and their sleigh and arranged them in "reindeer" order, with a white tiger filling in for Rudolph. "Rudolph" was holding the gifts, and there was a nice letter from Santa tucked in the sleigh. The girls received pajamas, which is tradition here, and they wore them to bed last night. Now they really can't wait for the Big Day! Little ol' me! 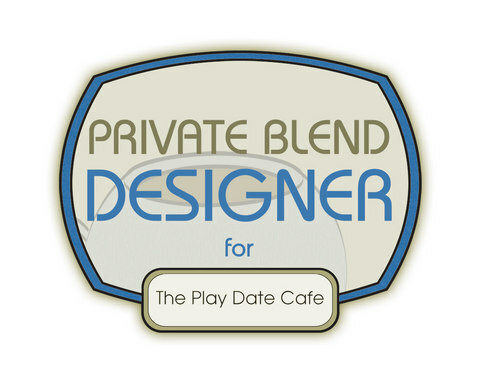 I've been chosen as the Private Blend Designer for The Play Date Cafe! Whoo hoo! What an honor. I consider the Cafe to be one of the classiest challenge blogs around, and boy am I proud to be a part of the team. I truly feel blessed to be given this opportunity, Julie and Sarah. Thank you! Julie and Sarah picked out some awesome crafters to make up the next Design Team, and I hope you pop over to each of their blogs to see what I mean. Oh, I can't wait to get started! Wow, 6 cards (2 each of 3 designs) so far this week for me, and here it is Christmas week! I honestly didn't think I'd be making cards so close to the holiday, but I'm almost ready with all my holiday 'stuff' so I have a little extra time. And it's a good thing, too: stamping is therapy for me - I know it is for a lot of you out there, too - and I'm STRESSED! And also at Splitcoast, the Free For All #43 is to make a birthday card, so that's what this one is. 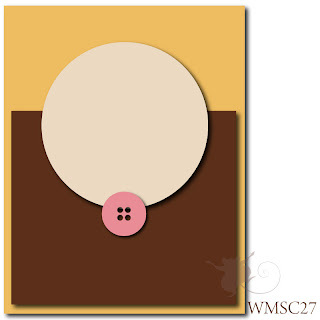 See my pop of yellow on the 'button'? I made that with a stamp from Simple Delights (SU), using Summer Sun and Basic Black inks and two circle punches, 3/4" and 1". Some white rick-rack trims up the envelope design (it is for show only; it opens like a regular A2 card). I'd better go wrap some more gifts now. I have to work tonight until 11:00, and believe it or not, also on Christmas Eve until 8 pm. So I need to get my stuff done! Thanks for joining me today, twice. And I hope you pop back tomorrow for my BIG NEWS! Punches: circles 3/4" and 1"
I made two of these cards in no time at all, because the snowman (which already boasted the challenge colors) is a gift tag saved from last year, and I had two of them. I did nothing to him, except thread some baker's twine from The Twinery and green metallic cording through the tag hole. Easy, easy! I hope you are not tired of seeing my same Martha Stewart punched snowflakes over and over again. For Christmas, I asked for a different snowflake punch! These glimmery ones were punched out of Cameo Coral to try to match the snowman's accessories. I'm back with a quick Christmas card that was inspired by a luscious shower curtain I saw in a magazine. The magazine, Where Women Create, by Stampington & Co., is HIGHLY inspiring to my card-making. The photos are gorgeous, the work featured in each issue is incredible, and I go crazy with ideas for cards! This will be for my 12 year old 'fashionista' daughter, who loves bling and elegance. Instead of designer paper, I used a scrap of wrapping paper from the $1.00 bin at Target. So I got out a black Sharpie marker and colored those letters I needed. Don't forget to do the edges! With a fine point marker, I added the umlaut (those two little dots over the "o")(I took several years of German language in middle and high school). Over the weekend, this card - Frosty - was named as A Cut Above Winner at The Paper Players. Yay! Thank you, Anne Marie, for choosing my card! Hello everyone! 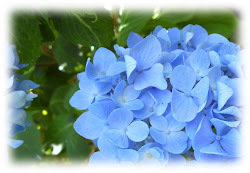 If you are looking for the Blog Candy post, please scroll down several posts. Contest ends soon! I put them in two posts because I want to enter each in different challenges. This version is more elegant, the other more cute and whimsical (see this post). I colored an ornament from Flourishes' All That Glitters using Copic markers. I also added touches of gold with my new Smooch Accent Ink. Neat stuff! It has a superfine brush tip to add the gold just where you want it. I kept the wreath made of Rose Leaf punched leaves, but adorned it with bling instead of twine. I really didn't need to make any more Christmas cards, but they're just so much fun to make I kept going! Now I'm "ahead" for next year. Thanks for joining me once again today. Hello everyone! If you are looking for the Blog Candy post, please go down several posts. It sure feels frosty here in New Jersey today! We are expecting an inch of snow this afternoon. I know it's not much, but it might be a white Christmas after all! Isn't he cute? The snowman is from the Stampin' Up! Snow Buddies set, and I drew in the horizon line with a black SU marker. The accessories he wears were colored with SU markers, as well. The ground is covered with sparkly "snow" (Martha Stewart glitter), as is one side of his face and body. The wreath surrounding him was assembled using a Martha punch called Rose Leaf. It's a new toy and I love it! Also new to me: the Maraschino twine from The Twinery. I picked up two of their sample packs on Cyber Monday at a discount. 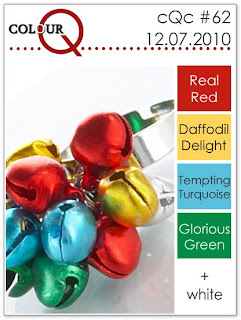 My blog candy is coming to a close on Sunday, December 19, 2010. Make sure you check out this post to enter! I won an award on 12/11/10 at The Paper Players Challenge 27 for this card, Inspired by a Stack of Gifts. And for my Peace Wreath card I was named Colour Queen Courtier on 12/13/10. Thank you, design teams, for choosing my cards - I am very grateful. I have one other big announcement but I cannot give you the details yet. I'm bursting at the seams with excitement about it, though! There's another I need to post after this one, so I'll see you soon. Thanks for joining me today! Techniques used: emboss-resist (check out this tutorial on SCS), masking and sponging. I had all of these dye inks out for sponging: Perfect Plum, Lavender Lace, Tempting Turquoise, Ballet Blue, and Brilliant Blue. The emboss-resist technique is this week's Try a New Technique challenge at Splitcoast. Thanks for joining me today! Keep your eyes open for Blog Candy here very, very soon. I am in a celebratory mood because my blog has over 10,000 visits. I am so grateful to you all. The card measures 4 1/4" square, so it will fit into an A2 envelope (having to pay extra postage at this time of year turns me off, which is why I went with this size). I loved adding the 'ornaments' to the wreath, which is a stamp from a Mark's Finest Papers set called Seasonal Poinsettias. I won this set a month or so ago, and I've gotten so much use out of the sentiments it comes with. This is the first time the poinsettia wreath has seen ink. I like it! 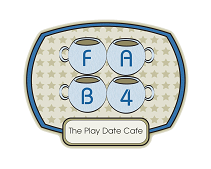 I found out this morning that my Inspired by a Stack of Gifts card won a FAB 4 Badge from The Play Date Cafe! And finally, I received an award from one of my favorite bloggers, Ann Schach, a couple of days ago. Ann makes utterly gorgeous creations and sits on the Design Teams for Pals Paper Arts and The Paper Players and is an alumni of Splitcoast's The Dirty Dozen. Ann, thank you so much for the award! I lived in Houston, Texas for six years. I love, love, love Yankee Candles and have a candle 'wardrobe' for different moods and times of the year. As a substitute teacher, my favorite grade to teach is First Grade. They're just so darn cute! Organizing anything helps calm me down. I adore my "alone" time, when the kids are in school and husband's at work. I laugh at silly things, like this YouTube video with "talking" cats. Beatriz Jennings - Bety makes such breath-taking shabby chic creations - wow! Thanks for joining me today. I always appreciate any comments you have and the time you have taken to visit me. 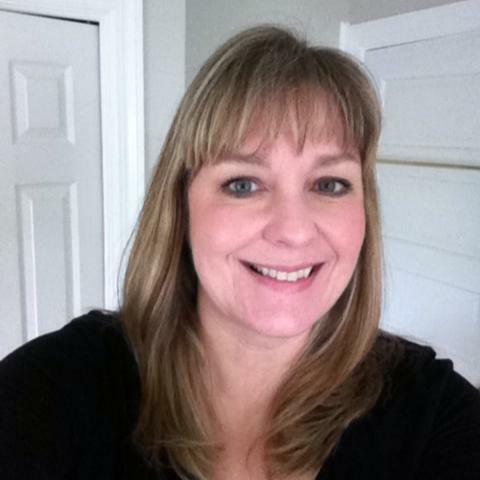 Stay tuned for Blog Candy, celebrating the 10,000+ visits to my blog!